I wanted to share a quick card I made for Thanksgiving today. Now surprise I did not use any die cutting system except scissors and a fiskar cutter for this one. My handy dandy Dover Image and Illustrator , some cardstock (green) and pattern paper, ink, glue - zip dry and pop dots and glue dots, some twine and ribbon and wait for it - a party ring and I was in business. Party ring ? what party ring? Someone gave my son some party rings in goody bag. He told me Mom I am a boy what will I do with this? You can have it and so the party ring was manhandled and the ring part cut off (pretty easily as it was plastic) and lo behold an embellishment. The border/pattern in the pattern was a bit too large and I wanted more of the brown to show through so I cut the border/pattern and used it for the inside and the label sentiment on inside. The label yellow was left over scrap from another project I wrote Happy Thanksgiving on it and doodled a bit . Matted it with brown pattern paper. Added some more border pieces which I had cut .Tied some twine and added a blue rhinestone and card is done. 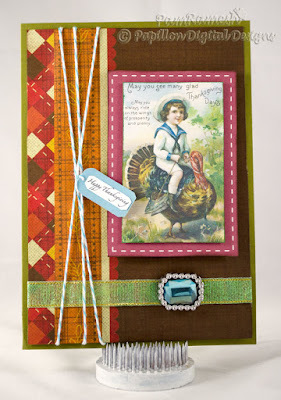 A quick simple card for Thanksgiving. Thanks for reading this post . I so love to hear your feedback and comments. Thanks for taking the time to leave comments. It is so much appreciated and inspiring. 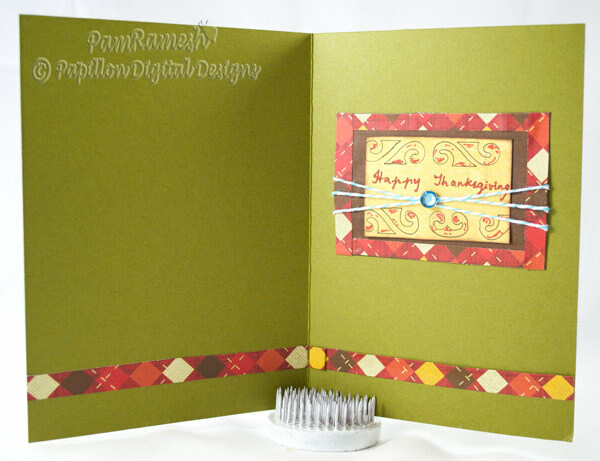 Please do share your Thanksgiving Card in the linky tool below.